I had a chicken and an egg problem because I didn't know where to start the lifecycle. June 2008, I sowed some seeds and not many came up. Then, in the Fall, some lettuce and cilantro spontaneously sprouted. One single head of curly-leaved lettuce kept us in pretty greens for 4 months. Sure, we had to mix it up with romaine from the store, but that little plant sure was prolific. Three cilantro plants came up and I had a hard time using them up. When the weather warmed up in the late spring, they bolted and went to seed. I pulled them up and laid them on the potting bench to dry. I can use the seeds as coriander, or sow them to grow more cilantro. A couple of weeks ago, I scattered some seeds in the shady area by the front door. The germination rate of the seeds I saved is much better than for the seeds I bought in 2008. I don't know if it has anything to do with the difference in soil temperature. The seedlings are leggy; the area might be too shady. If the elm tree next door sheds its leaves soon, then the seedlings will get more light. In 2 months, I might be drowning in cilantro. In the mean time, I am enjoying the cilantro from our Tanaka Farms CSA boxes. Did you know that cilantro can keep for weeks if kept in a glass of water in the refrigerator? Just trim off a bit at the bottom of the stem and put it in water (like you would put flowers in a vase). 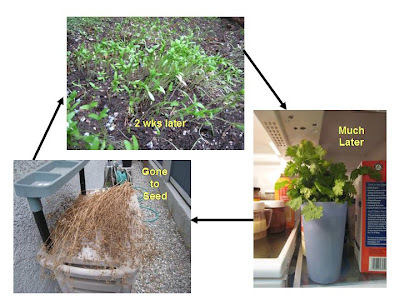 Put a loose plastic bag over the cilantro or else they will evapotranspirate like crazy and humidify your fridge (not a good thing). Change the water once in a while. Oh, now you have seen the inside of my fridge. Did you take The refrigerator personality test? I just have to explain that is not my bottle of iced oolong tea in there. A friend came over and brought it with him. If I want iced tea (and I would only drink oolong hot), I would just brew some leaves up and chill the tea. The box of soy milk and 2 types of home-made salad dressing are typical. My neighbors are ready. Note the quintessential southern California pairing of cactus and roses. Unless a parent gives permission, I crop out other kids when I post photos of Iris. Remember Iris doing yoga moves in Pink Camouflage? When I looked at the pictures I took that morning, the diversity of her school really popped out at me. Unfortunately, I had to crop out the other kids. But the Daily Breeze posted a slide show of her entire school doing morning exercises in the playground. This is what a diversity rank* of 10/10 school in California looks like. IMHO, it is pretty darn cute. The kids appear to be doing fine. If Pat Buchanan doesn't like it, he doesn't have to come visit. *What is the probability that any two students chosen at random would be of different ethnicities? If all students are of the same ethnic group it's zero. If half are from one group and half from another it's 50%. If several groups are divided evenly, it would be higher. We use this figure to rank schools into 10 groups of even size. Schools with a diversity rank of 1 are the least ethnically diverse. Those with a diversity rank of 10 are the most ethnically diverse. When I compare the reported statistics with the families I see, I suspect that they count mixed-race families as the non-white component of the families (the one drop rule). We checked off both white and Asian. But, it looks like Iris was categorized as Asian. The school district to the west of us classifies mixed-race families as "decline to state" or "other". That district is more diverse than they get credit for. Statistics can be skewed by reporting inconsistencies like this. In my highly unscientific sampling of other families, I learned that the mixed-race families mostly met in grad school. That would explain why "minority" kids score higher on the API than the rest. See school correlations. Mardel wrote about Food Memory just when I have been thinking a lot about it. I have been very frazzled of late and picked up a brainless mystery, The Unexpected Mrs. Pollifax, which takes place around 1966, at the height of the cold war. When the story invoked a sinister axis of communist influence, which includes Cuba and China, all I could think was, "Yum." I recalled the first time I had Cuban Chinese food (lower east side, NYC) and the stir fried veggies with curry sauce. It had lots and lots of onions and bell peppers, smothered in curry. I can almost smell it, even 20 years later. A friend had gone to grad school in Minnesota and married a Minnesota Swede. We overlapped in Colorado during his residency. The first time I met her, my friend and I started to reminisce about Berkeley restaurants and particular dishes. At one point, he mentioned a burger joint and then we both paused to savor the taste and smell, 6 years after we had enjoyed the burgers. She thought we were just plain weird. Food is fuel. End of story. She said that he was the first person that she had ever met that would talk about a meal he had years ago. I was not the first friend of his that she had met that talked about food. She now thinks it is a California thing. Then she met Bad Dad. Bad Dad will obsess about food. At the restaurant, he will ask the waiter what spices they used and then go home to try to reproduce it. He will do it again and again until he is satisfied. he does this with music, too. He'll pick at the keys on the piano, trying to replicate a melody he heard. I am trying to channel his obsessiveness into cleaning the house. No luck so far. Anyway, he said that we lived on the same floor; could we do our homework together? Well, he turned out to be a nice guy. He wrote poetry. He read novels in French. He read philosophy and wondered where he would find the time to learn Greek so he could read them in their original Greek. He edited the Vietnamese language literary magazine on campus. He had a lovely girlfriend that he went home to visit every weekend. He needed to work very hard and smart during the week so that he could continue to do all that. Finding homework partners helped. Homework evolved into friendship. We walked home from class together. I learned that his dad had been a high school teacher. After the fall of Saigon, books were supposed to be turned in to be burned. His dad buried books of western history and philosophy under the floorboards. At night, after a day of hard labor or communist-sanctioned school (father and son, respectively) they brought the books out and his dad home-schooled him. My friend introduced me to the chocolate croissants at the French bakery on the corner of Euclid and Hearst, by the north gate of the Berkeley campus. He couldn't do math homework without it. I thought it was odd, because money was so tight for both of us and chocolate croissants are not cheap. But, he told me about going into the city with his dad before the war, and how they would always stop at a French bakery for a treat. Sometimes, kids were sent to work in the rice paddies in lieu of class. Everyone was sent when labor was needed. He talked about the leeches that would cling to his skin. What did he do? What could he do? He picked them off and continued to work. The soldiers directing the work had guns. He added that some people ate leeches. Protein was in short supply then. The story has a happy ending. The family was reunited in a refugee camp in Thailand and then moved to California. Last I heard of my friend, we were heading off to different grad schools to study Physics. Almost a decade later, Bad Dad and I bicycled through the south of France and stopped by a Roman ruin. I was much more tired than he was. While he explored further, I followed my nose to a bakery where I discovered the most exquisite pain au chocolat of my life. Every time I eat one, I think about my friend, Ngan, and that sunny day in Provence with Bad Dad. When I signed up to participate in Blog Action Day 2009, I didn't realize how crazy busy my month would become. Fortunately, the topic is one that I revisit periodically on this blog so I won't have to start from scratch. When last I discussed why we all need the polar ice caps, I don't think I was very coherent. So I will try again. When the sun beats down on my dark hair, I put on a light colored hat. The hat reflects the sun's heat and keeps me cooler. Polar ice caps perform the same function, but on a planetary scale. Without it, we are all gonna fry. Is that clear enough? Then I droned on about the planetary radiative budget--the balance of energy in and energy out. Read the entire earlier post. Explore all the links. I will wait. The main point I was trying to make was that the earth's surface reflects about 10% of the solar radiation back into space, mainly from high-albedo (fancy term for very reflective) regions. Ice is about as reflective as it gets. Moreover, the earth's axis is tilted and the summer pole's ice cap represents a large portion of the earth's surface that is exposed to the sun. It performs the very important role of planetary sun hat. That's why scientists wring our hands and drone on and on about the decline in the areal extent of the polar ice caps during the summer season. Anyway, the mainstream media is still missing the big picture. How many headlines have you read exclaiming that the polar ice cap is growing? Global warming has been reversed. Hallelujah! The National Snow and Ice Data Center has posted a very nice explanation about why it is too early to rejoice, Arctic sea ice extent remains low; 2009 sees third-lowest mark. We've only had polar weather satellites for about 50 years, but this is still deeply disturbing because of Milankovitch Cycles and Glaciation*. The news becomes even worse. Not all ice cover is created equal. Thinner ice is more likely to melt completely in the summer. Thicker ice gives more climate insurance; it gives us that extra margin of safety. * Milankovitch was a mathematician who theorized that the precession (wobbles) of the earth's spin are related to the periodic ice ages. 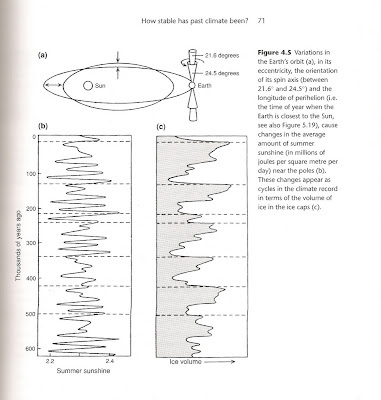 This graph from the third edition of Global Warming: The Complete Briefing by John Houghton, was my wake up call. As the earth's spin axis wobbles, the amount of summer sunshine we get varies. In the last 600,000 years, every orbit wobble that results in a decrease in summer sunshine has been associated with growth in ice volume EXCEPT in the last 150 years. What happened 150 years ago? We ramped up our consumption of fossil fuels and started to pump ever increasing amounts of CO2 and other greenhouse gases into the atmosphere. In February, I wrote about climate change and Ocean Acidification. My Blog Action Day 2007 post, Walking My Watershed. Richard Mason asked in the comments to School Correlations why test scores dipped between 3rd and 4th grade at my daughter's school. I didn't have a good answer for that; I suspected it had to do with student turnover. Now that I have observed the 4th grade teachers in action, I have a better explanation. Test scores tell you how well the kids did on that particular test. They don't tell you what else (if anything) they learned. Two schools can attain the same mean test scores, but one school may have spent half the school year prepping the kids for the test, to the exclusion of all else. The other school may have done nothing more than put aside their regular instruction for the test day(s). Remember when we pulled Iris out of school for a week in April/May 2008 for a trip to Hawaii? I was astonished by the number of school-aged kids there at the same time. In speaking with the other parents, I learned that the weeks leading up to standardized testing are the perfect time to take a vacation with bright kids. The kids were missing nothing but drilling. The teachers were happy to get rid of the kids who would do fine on the tests without drilling. That way, they could devote more time to the struggling kids. We thought about taking a vacation in Spring of 2009 as well, but I was too ill at the time. We kept waiting for the drilling to occur, and it never did. Iris' 4th grade teacher doesn't believe in drilling for smart kids. She said that it pisses them off and causes a discipline problem that no one needs. She went on that her 'learning center' kids were being prepped for exams by the teachers there, and the rest of the kids would do fine without test prep. The STAR results back up her methods. 75% of the 4th graders scored at the advanced level. But, I think that the drop between 4th and 5th grade says more about the mix of kids in those cohorts than about the teachers. You'd have to look at a longer time span to draw any conclusions. I will say that my kid was happy that her teacher last year didn't assign tons of homework. Some educators believe that kids learn through repetition. Others believe that too much repetition will turn the kids off from the learning. Both can cite evidence that support their view. The truth is probably in between. Some kids do learn from repetition. But once they master a subject, drilling them further would annoy them and cause them to make more mistakes. I don't even think the same kids respond to the same treatment in different subjects or on different days. Heck, I know that my annoyance level and attention to detail vary from day to day. Wow, that was a long introduction. Anyway, in 4th and 5th grade, my daughter's teachers allow the kids to test out of math units. In 4th grade, if the kids passed the pretest with 85% or more, they didn't have to do the homework or take the final unit test. They were allowed to select from some other math enrichment activities. This year, in 5th grade, her teacher allows the kids to test out of homework. She came home very upset last night, with 17 out of 23 possible points on her math test. Her errors? She lost 1/2 a point for every time she didn't label her units or wrote down the answer in an incomplete equation. She did all the calculations right. She was looking for sympathy. I wouldn't tolerate an incomplete equation any more than I would tolerate an incomplete sentence. That is is ok for casual conversation (or blogging), but not ok for a test. Bad Dad and I were in perfect agreement about units. She is too young to remember the loss of the Mars orbiter because one team used metric units and the other used English units. It never occurred to them to check with one another because they assumed the rest of the world operated the way they themselves did. That engineers still use English units was a complete shocker for me; scientists use metric. So perhaps the notion didn't occur to the NASA scientists either. So she will have to do drill and kill this week until labeling the units is as natural as breathing. I didn't tell her that mommy was the scary TA that took points off lab reports for each spelling and grammatical error. If your language lacks attention to detail, will people have faith in your calculations? In the false color image, you can see the burn area and past burn areas that have not yet recovered. Look at the sizes of the burn scars from the Station fire (immediately to the west of the current fire) and near Santa Barbara. 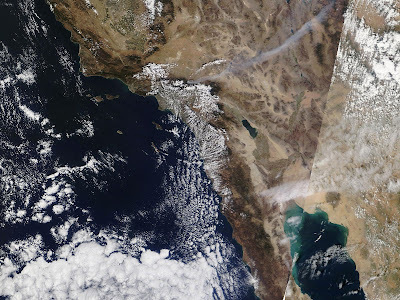 Malibu and Baja California also show evidence of recent fires. You can always find more imagery at the MODIS Rapid Response System website. The La Jolla Subsets are of particular interest to Angelenos and San Diegans. Santa Barbara residents may be more interested in the Fresno subsets. They provide imagery in 2 km, 500 m and 250 m resolution. 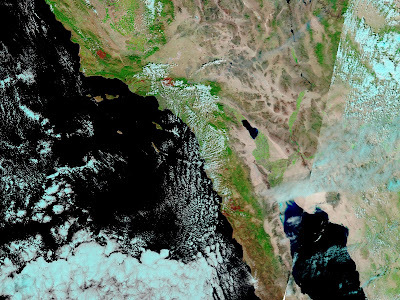 The California Regional Weather Server at SDSU shows handy jet stream analyses like this one, from around the time of the Terra imagery above. We were lucky that the wind was blowing smoke away from population centers. The jet stream is still overhead. We will have several days of cold, windy and unsettled weather, perfect for the new mommy and me riding boots that Iris and I bought over the weekend. The jet stream is a high altitude current of fast-moving air. Surface winds do not necessarily coincide with the jet stream, but they are influenced by them. Right now, the sum of the jet stream and our seasonal Santa Ana winds is producing very calm wind conditions near the fire. That's the good news. We have season tickets to the Civic Light Opera of South Bay Cities. So do the parents of the world's greatest nanny (WGN). We ran into them last weekend when we saw Oklahoma. What a delightful coincidence! I was going to call WGN to enquire if she was coming home from college for her birthday weekend. The chevron sweater was a tad too large in the bust for me, but would look fab on her. Here's the photographic proof. Instead of blogging about yet another wildfire and swarm of earthquakes, let's talk about why I love LA. Yesterday, after a noon-time soccer game, we ran an errand in Orange County. We asked Iris what she wanted to eat for 'lunner' (her name for the PM alternative to brunch). Did she want Chinese, Korean, Indian or Japanese? "Japanese." She is predictable only when it comes to food. But we were so close to Pioneer boulevard, home of Little India (and the second largest enclave of Indo-Americans in North America)! How would she like to try an Indian snack and sweet shop? It was not a hard sell. We visited Rasraj (for our second time). If you click through and then click on the sweets tab, these desserts will scroll across your screen. Try not to drool. But Iris saw the case of mousses and she was a goner. Bad Dad and I insisted on eating something before dessert. We ordered the vegetarian sampler and a dosa. I forgot to take a picture before we dug into the okra. It reminded me of The Enthusiast. Heather always tantalizes me with what she had for dinner. We share a love for okra, and okra is much easier to obtain where she lives. Heather, this photo is for you. My eyes gravitated to a section of the menu labeled "Desi-Chinese". It had a dish called "Hakka Noodles". One of my grandmothers was Hakka (actually part Hakka and part Dutch--hence her childhood nickname of "yellow-hair"). It turned out to be pan-fried noodles and veggies in a curry sauce. It was OK, but I prefer the Hakka Noodles you would get in a Chinese restaurant. Afterwards, we let Iris choose her mousse and I selected a pound of sweets from this case to bring home. We just ate a few pieces tonight. Last month, I had an expiring gift certificate to Books Sanseido. I dragged Iris to Mitsuwa Marketplace in Torrance. Iris was a good sport about accompanying me, but she stipulated we had to eat lunch at the food court. We were happily surprised to encounter the Hokkaido Gourmet Food Fair. Some of my family immigrated to Hokkaido and I am very fond of the cuisine there. Hokkaido is famous for fresh seafood of exceptional quality (it's the cold water), ramen with miso paste, and curry. Here's a partly-consumed curry ball. We also enjoyed squid marinated in teriyaki sauce, stuffed with sushi rice and then grilled over charcoal. Of course, she ran over to Italian Tomato, a Japanese bakery chain that sells ersatz Italian desserts. They are really Japanese interpretations of Italian food, distinct from Italian cuisine. But they are very, very good. Here's Iris enjoying her Tiramisu, with my coffee jello in the foreground. To complete our LA world dessert tour, here are some treats from the European Community Market and Deli in Huntington Beach. I get my Mrs Stylebook from Books Sanseido in Torrance and Burda World of Fashion/Style from the European Market in Huntington Beach. Both stores order only 2 copies of each magazine per quarter/month. You need to be quick to get your copy. Call the stores in advance so they hold it for you. If MSS sells out, you can always special order another copy. But if BWOF sells out, you are SOL. I found this great pink leopard print cotton jersey at the Cotton Shop. I bought a yard, thinking I could make any kind of Iris-sized top with that. She looked at it, and then said that animal prints are my thing, not hers. All-righty, I made a top for her younger cousin; she has a birthday coming up. There was enough left over to make a hooded shirt. Can you imagine a 4 yo hiding under that hood? Walking to school, you can see the hood behind the backpack. I highly recommend Kwik Sew 2893. You may recall seeing it last summer in Sweatshop. She's grown from a size 7-8 to a size 10 in the past year. The full pattern review is here.